It’s been quite a year for Tennis Canada’s 2017 Player of the Year. On the back-end of a career-best finish in 2016, the 17-year-old picked up right where she left off in the New Year. She hit the ground running with a series of outstanding results, which might have initially come as a surprise of sorts to some, but were—without question—just the next steps. Bianca is in the midst of a steady transition from being one of the world’s most successful juniors to one of the most dangerous upcoming talents on the women’s tour. Having never made it past the final four in six previous Junior Grand Slam appearances, the Mississauga native started her year off with a bang at the Australian Open by equalling her best-ever finish in singles. Later on, she would earn her first Grand Slam title, with fellow Canadian Carson Branstine, in what she called one of the most satisfying and emotional wins of her career to date. One could argue that it was, in fact, the confidence she slowly built up over the course of a picturesque couple of weeks in Melbourne that served as the foundation for the Canadian teenager’s monumental year of firsts. Following her heroics Down Under, Andreescu would live up to her billing as one of Canada’s brightest rising prospects. Going 6-0 in her professional Fed Cup début, she lead the team—in the absence of Eugenie Bouchard and Françoise Abanda (the only two players ranked higher than her) —to a spot in the World Group II Playoff, avoiding relegation after a valiant but disappointing 2016 campaign for the Canadian team. A couple of months later the Canadian teenager would further increase her name recognition by clinching the decisive victory over Yaroslava Shvedova of Kazakhstan. This sent Canada back into World Group II for 2018—an achievement made all the more special in a place that Andreescu has come to hold very close to her heart in recent years. Bianca envisions where she will toss the ball to hit her intended serve. 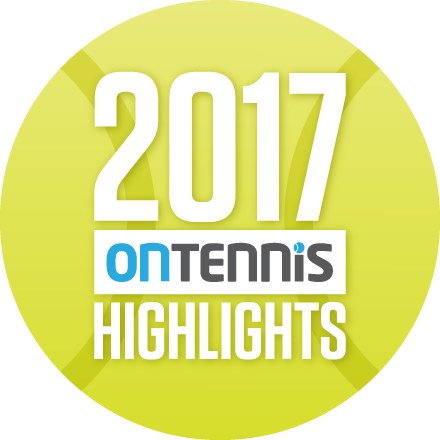 On top of her outstanding success on the world stage, Andreescu also tasted success on the Challenger circuit by adding a pair of $25,000 titles to her very impressive first half of the 2017 season. While every title undoubtedly comes with its own significance, it’s safe to say there will be few that will ever leave the same impression on the Canadian as the titanic three-and-a-half hour battle she won against American Bernarda Pera to pick up her second title of the year in Santa Margherita Di Pula, Italy. Battling the elements on a muggy spring day on the Italian coastline and an opponent that just simply refused to back down, Andreescu was forced to dig, deeper than ever before, to save a pair of championship points en route to edging out the final-set tiebreak, 10-8. It was one of the most memorable wins of her young career. ”That match was such an incredible battle,” she recalled. ”I have always prided myself on never giving up and being a battler, no matter what the score is. I just stayed focused and somehow won the match. As fate would have it, learning experiences like this one were a frustratingly regular occurrence for Andreescu in 2017, but they are a crucial part of the young Canadian’s development if she hopes to continue her outstanding rise up the professional ranks, as noted by her mother, Maria. In doing so, the 17-year-old has been able to continue to flourish under the spotlight. Most notably in her professional début at Wimbledon she was able to secure her spot in her first Grand Slam main draw with a slew of dominant wins in qualifying. Following her memorable début on the green lawns of the All England Club, Andreescu returned home for a brief training block before setting out on the famous North American hard court swing in the lead-up to the last major of the year in the Big Apple. The immediate results really do reaffirm her early potential. In her first tournament back after a month hiatus the Canadian teenager made history when she became the first player born in the 2000’s to upset a top-20 player (world number 13 Kristina Mladenovic), on her way to reaching her first tour-level quarterfinal in Washington D.C.
Bianca focuses on the incoming ball as she prepares to hit a one-handed backhand. A week later, at none other than the Rogers Cup presented by National Bank, Andreescu continued to turn heads when she recorded yet another big win—this time with Branstine in their first big match since clinching their second Junior Grand Slam title as a pair at the French. Despite a considerable mismatch in doubles experience on paper, the two Canadian teenagers produced some magical tennis under pressure to stun the experienced pair of Mladenovic and Anastasia Pavlyuchenkova in what was, without question, one of the upsets of the tournament. But what do these two young women attribute to their success in 2017, which saw them go 15-3 overall and end the year by reaching their first WTA final in Québec City? The secret to their success is rather simple: their close-knit friendship. Since Branstine’s decision to switch to representing the Maple Leaf in late 2016, which prompted her immediate relocation to Tennis Canada’s National Tennis Centre, the two have grown closer both on and off the court. They share similar interests and goals of one day becoming and competing with the best in the world—much like a certain Canadian who tasted an outstanding amount of success last summer. This past August, the tennis world was taken by storm by the arrival of 18-year-old Canadian Denis Shapovalov onto the international scene at the Rogers Cup, where he made a magical run to the semis—defeating the likes of Juan Martin del Potro and Rafael Nadal on the way—and captivating fans of all ages from all over the world, including Andreescu. Like Shapovalov and compatriot Félix Auger-Aliassime, Andreescu was one of the successful juniors who began to make the full transition to the pro tour in 2017, choosing to do so after winning the French with Branstine. While her results were certainly one reason for this change, it was the advice of a certain former world number one (and fellow Romanian) that really pushed Andreescu to take that next step towards her dream of one day being in that same position. Bianca makes contact with the ball on her powerful forehand. As Andreescu tries to get her 2018 season off to the kind of start that set the tone for her historic year of firsts, the Canadian teenager reflects on 2017 with, yet again, maturity beyond her years. “This was for sure a transition year for me, moving more fully into the professional ranks. With the lessons of 2017 firmly under her belt, Andreescu hopes to continue her steady rise up the rankings in 2018, with the ultimate goal of breaking into the world’s top 100 by year’s end. This goal becomes even more achievable once Andreescu turns 18 in mid-June, at which point she will no longer be subject to the ITF’s Age Eligibility Rule, which restricts the number of professional tournaments a teenager can play in a year. In addition, the young Canadian will be looking to find similar success competing under the Canadian flag when she returns to her family’s roots to compete in a highly anticipated Fed Cup tie against Romania. With plenty of family flying in from all over Romania to see her play in person for the first time, Andreescu says it will be a very special occasion, particularly as she considers the prospect of competing against players she has looked up to for most of her career, including Halep. With a new chapter of her career on the horizon, Andreescu has more than proven herself as one to watch for many, many years to come, but just how much farther can she go in the new year? One thing, however, is for sure: The future of Canadian tennis sure looks brighter than ever with this young woman leading a young and very talented new generation.